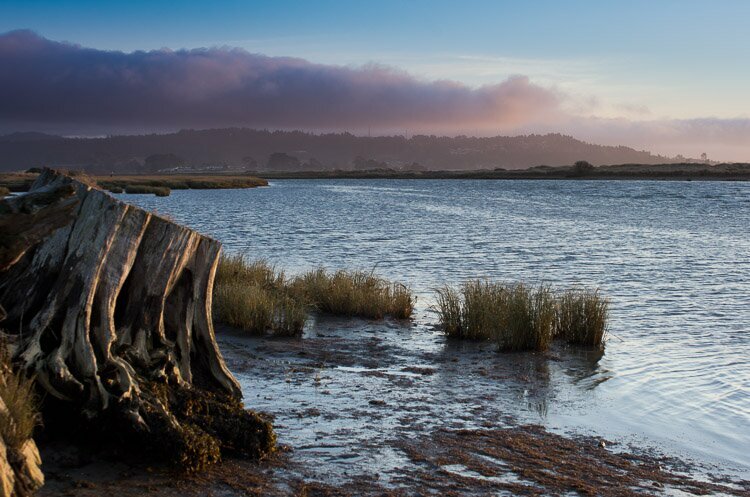 Fields Landing is a small community facing the entrance to Humboldt Bay. If a tsunami were to strike the northcoast head-on, this area would easily be wiped out. There’s not much to photograph around here, unless you like small old houses, some of them kept up nicely, some of them not kept up so nicely. Also some industrial stuff and a boat yard. As we proceed northward we enter cross the Elk River and enter Eureka, the county seat of Humboldt County. A little ways into two there’s a road that heads off to “coastal access.” It’s here we find the entrance of Elk River into Humboldt Bay. Marshy, flat, and not particularly scenic, it’s a favorite hang-out of egrets and other shorebirds, none of whom will anywhere close enough to them to get a picture. When you’re lucky, this is a good spot to watch the setting sun.